Historical Identification: Per Dreyer, NGC 3950 (= GC 5591, 4th Lord Rosse, 1860 RA 11 46 22, NPD 41 19.4) is "extremely faint, 2.6 arcmin north of h 1009", "(JH) 1009" being NGC 3949. The position precesses to RA 11 53 41.4, Dec +47 53 53, only 0.8 arcmin north of the galaxy listed above, the description fits (the galaxy is only 1.6 arcmin north of NGC 3949, Lord Rosse's position and distance estimate being roughly an arcmin larger than the correct values) and there is nothing nearby that could possibly fit the description, so the identification is certain. 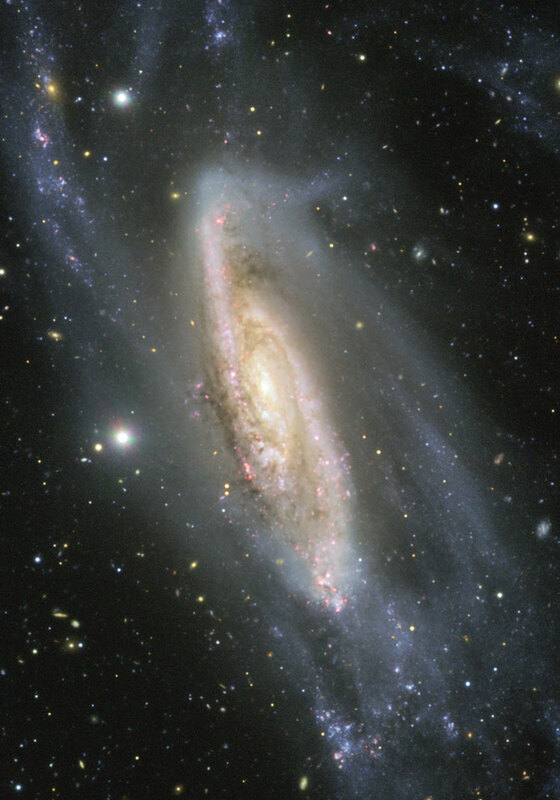 Physical Information: Based on a recessional velocity of 22365 km/sec, a straightforward calculation suggests that NGC 3950 is about 1.04 billion light years away. However, for objects at such a distance, we need to take the Universal expansion into account. 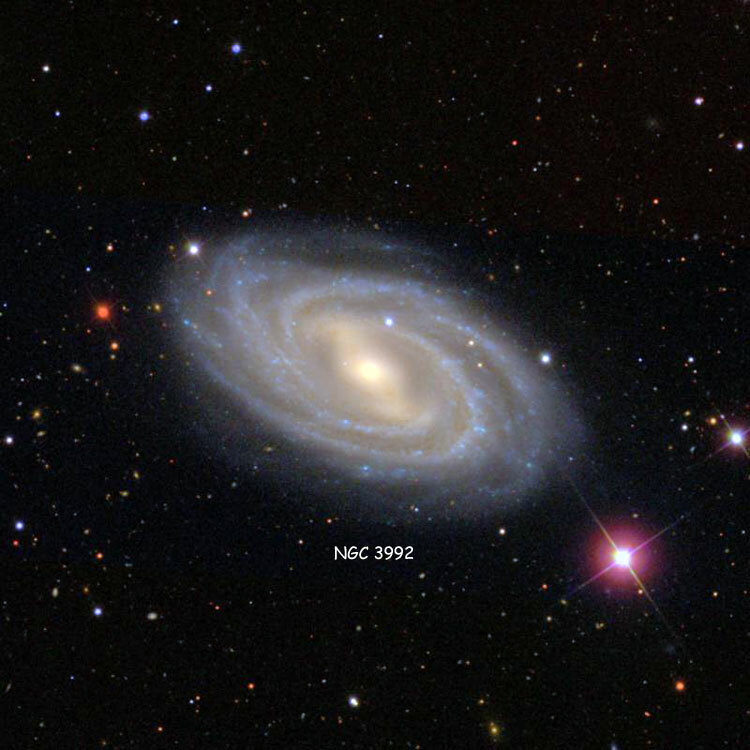 Doing that shows that the galaxy was about 955 million light years away when the light by which we see it left the galaxy, about 990 million years ago (the difference between the two numbers being due to the expansion of the intervening space in that interval). Given that and its apparent size of 0.40 by 0.35 arcmin, the galaxy is about 110 thousand light years across. Historical Identification: Per Dreyer, NGC 3951 (= GC 2605 = JH 1010 = WH III 342, 1860 RA 11 46 22, NPD 65 49.5) is "very faint, considerably small, very little extended". Historical Identification: Per Dreyer, NGC 3952 (= GC 2607 = JH 1012 = WH III 612, 1860 RA 11 46 28, NPD 93 13.4) is "considerably faint, considerably small, a little extended 90°±, brighter middle, mottled but not resolved". Historical Identification: Per Dreyer, NGC 3953 (= GC 2606 = JH 1011 = WH V 45, 1860 RA 11 46 29, NPD 36 53.1) is "considerably bright, large, extended 0°±, very suddenly brighter middle and large mottled but not resolved nucleus". The position precesses to RA 11 53 49.8, Dec +52 20 11, on the northern rim of the nucleus of the galaxy listed above and well within its outline, the description fits and there is nothing else nearby, so the identification is certain. 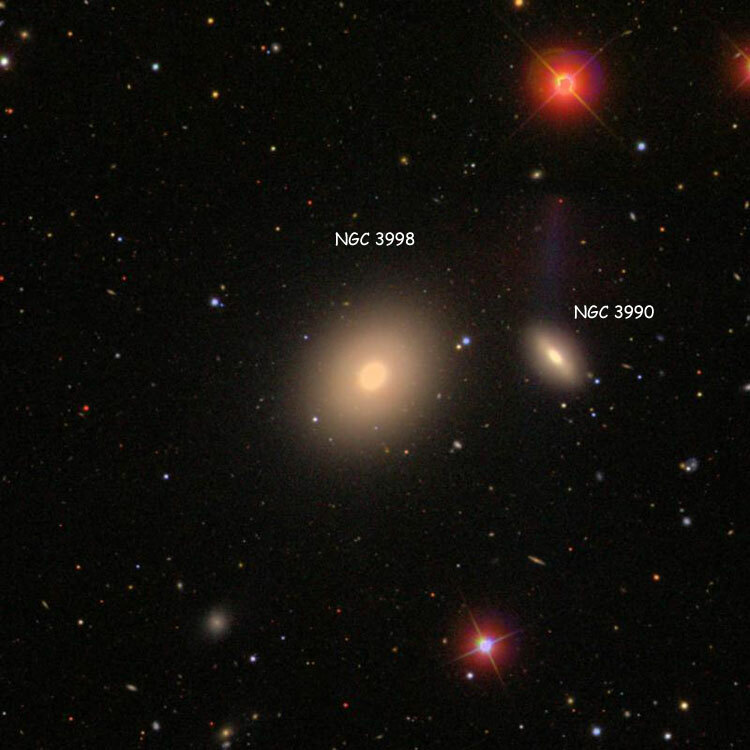 Discovery Notes: Until 2006 it was thought that Méchain's observation was of what became NGC 3992 (which see for more information about Méchain's discovery), and neither the Herschels nor Dreyer were aware of the prior observation under any identification, causing the lack of any mention of the French astronomer in either NGC entry. 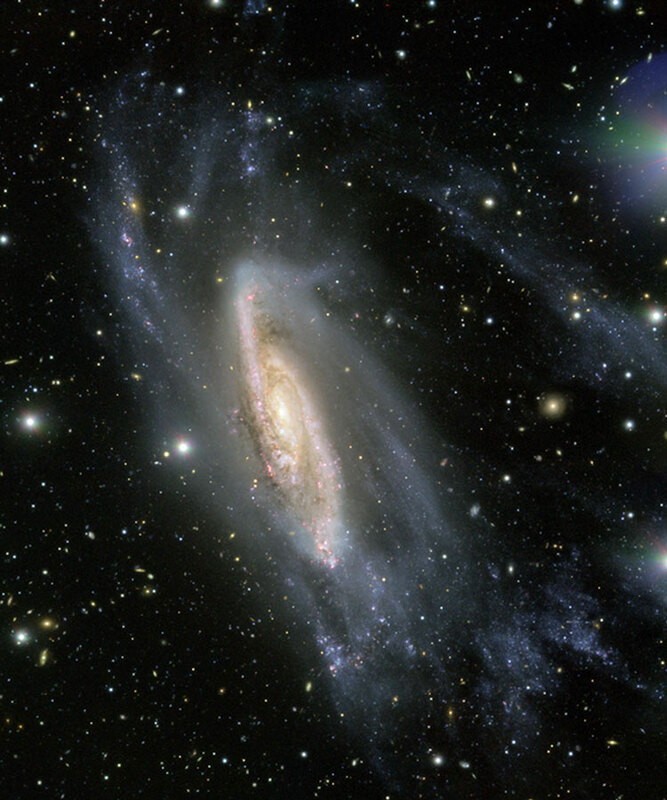 Physical Information: Based on a recessional velocity of 1050 km/sec, NGC 3953 is about 50 million light years away, in good agreement with redshift-independent distance estimates of 40 to 75 million light years. Given that and its apparent size of 6.6 by 3.1 arcmin, the galaxy is about 95 thousand light years across. Historical Identification: Per Dreyer, NGC 3954 (= GC 2608 = JH 1013 = WH III 381, 1860 RA 11 46 30, NPD 68 20.7) is "extremely faint, round". Historical Identification: Per Dreyer, NGC 3955 (= GC 2609 = WH II 623, 1860 RA 11 46 54, NPD 112 24.0) is "considerably faint, small, extended 170°±, a little brighter on the south". 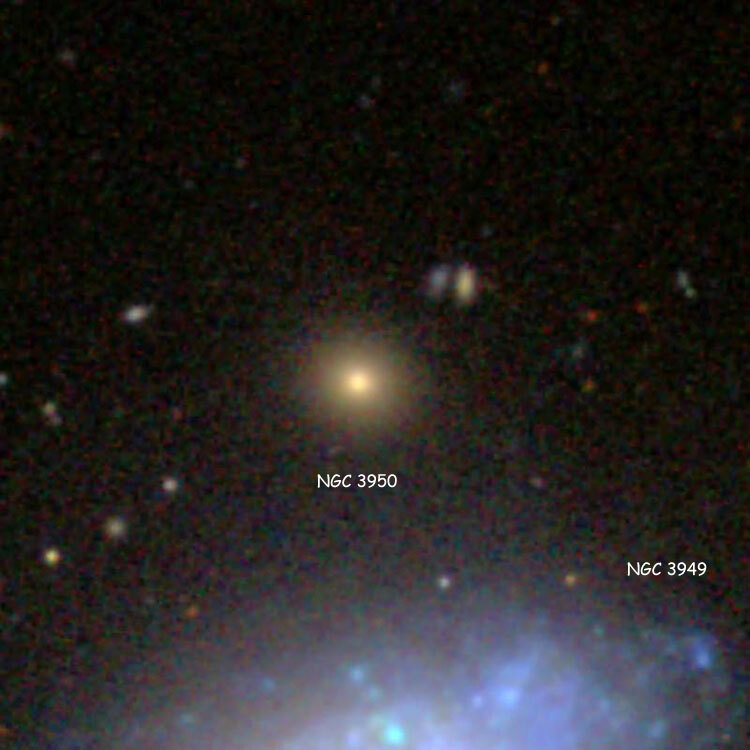 Historical Identification: Per Dreyer, NGC 3956 (= GC 2610 = JH 3368 = WH III 290, 1860 RA 11 46 57, NPD 109 47.5) is "considerably faint, pretty large, pretty much extended 57°". Historical Identification: Per Dreyer, NGC 3957 (= GC 2611 = WH II 294, 1860 RA 11 46 58, NPD 108 47.0) is "faint, small, extended, mottled but not resolved". Historical Identification: Per Dreyer, NGC 3958 (= GC 2612 = JH 1014 = WH II 833, 1860 RA 11 47 10, NPD 30 51.7) is "pretty faint, pretty small, pretty much extended, very gradually brighter middle". Historical Identification: Per Dreyer, NGC 3959 (Tempel list V (#11/12), 1860 RA 11 47 27, NPD 96 58.6) is "very faint, small, between 2 very faint stars". Historical Identification: Per Dreyer, NGC 3960 (= GC 2614 = JH 3369, Dunlop 349, 1860 RA 11 47 29, NPD 144 56.4) is "a cluster, pretty large, pretty rich, gradually pretty much brighter middle, stars 13th magnitude". Historical Identification: Per Dreyer, NGC 3961 (= GC 2615 = WH III 905, 1860 RA 11 47 31, NPD 19 54.0) is "extremely faint, very small". Historical Identification: Per Dreyer, NGC 3962 (= GC 2616 = JH 3370 = WH I 67, 1860 RA 11 47 33, NPD 103 11.8) is "considerably bright, pretty large, irregularly round, gradually much brighter middle, in a triangle with 2 stars". Historical Identification: Per Dreyer, NGC 3963 (= GC 2613 = JH 1015 = WH IV 67, 1860 RA 11 47 37, NPD 30 43.9) is "pretty faint, considerably large, round, very gradually then suddenly brighter middle". Historical Identification: Per Dreyer, NGC 3964 (= GC 2617 = JH 1016, 1860 RA 11 47 39, NPD 60 57.1) is "very faint, small, extended, 10th magnitude star attached on northeast". Historical Identification: Per Dreyer, NGC 3965 (Leavenworth list II (#452), 1860 RA 11 47 58, NPD 100 06.0) is "extremely faint, extremely small, round, brighter middle and nucleus, 9.5 magnitude star 4 arcmin to northwest". Historical Identification: Per Dreyer, NGC 3967 (Temple list V (#13/14), 1860 RA 11 48 01, NPD 97 03.9) is "very faint, small, faint star close to west". Historical Identification: Per Dreyer, NGC 3968 (= GC 2621 = JH 1018 = WH II 162, 1860 RA 11 48 15, NPD 77 15.1) is "pretty bright, large, irregularly round, brighter middle, 10th magnitude star 3 arcmin distant at position angle 65°". Historical Identification: Per Dreyer, NGC 3969 (Ormond Stone list II (#453), 1860 RA 11 48 17, NPD 107 58.0) is "extremely faint, very small, gradually brighter middle and nucleus, 10th magnitude star 4 arcmin to northwest". The second IC adds (per Howe) "RA 11 48 01, NPD 108 08.9, the star is 8.5 magnitude, and is nearly north". Historical Identification: Per Dreyer, NGC 3970 (= GC 2623 = JH 1020, 1860 RA 11 48 19, NPD 101 15.9) is "faint, small, round, pretty suddenly brighter middle, western of 2", the other being NGC 3974. Historical Identification: Per Dreyer, NGC 3971 (= GC 2624 = JH 1019 = WH II 724, 1860 RA 11 48 20, NPD 59 13.7) is "pretty faint, very small, round, brighter middle". Historical Identification: Per Dreyer, NGC 3972 (= GC 2618 = WH II 789, d'Arrest, 1860 RA 11 48 24, NPD 33 54.7) is "pretty bright, extended". Historical Identification: Per Dreyer, NGC 3973 (= GC 2622, 3rd Lord Rosse, 1860 RA 11 48 24, NPD 77 13) is "extremely faint, extremely small, 10th magnitude star 1 arcmin to southeast (requires verification)". Historical Identification: Per Dreyer, NGC 3974 (= GC 2625 = JH 1021, 1860 RA 11 48 32, NPD 101 12.7) is "very faint, small, round, brighter middle, eastern of 2", the other being NGC 3970. Historical Identification: Per Dreyer, NGC 3975 (= GC 5593, 4th Lord Rosse, 1860 RA 11 48 33, NPD 28 41.5) is "very faint, very small, II 840 seventeen seconds of time to the east", "(WH) II 840" being NGC 3978. Historical Identification: Per Dreyer, NGC 3976 (= GC 2626 = JH 1022 = WH II 132, 1860 RA 11 48 47, NPD 82 28.3) is "bright, pretty large, considerably extended 30°, very suddenly much brighter middle and nucleus". Discovery Notes: Palisa's observation is on page 349 of Steinicke's S360, and not only gives the (1886) position but also states that the object is GC 2626. 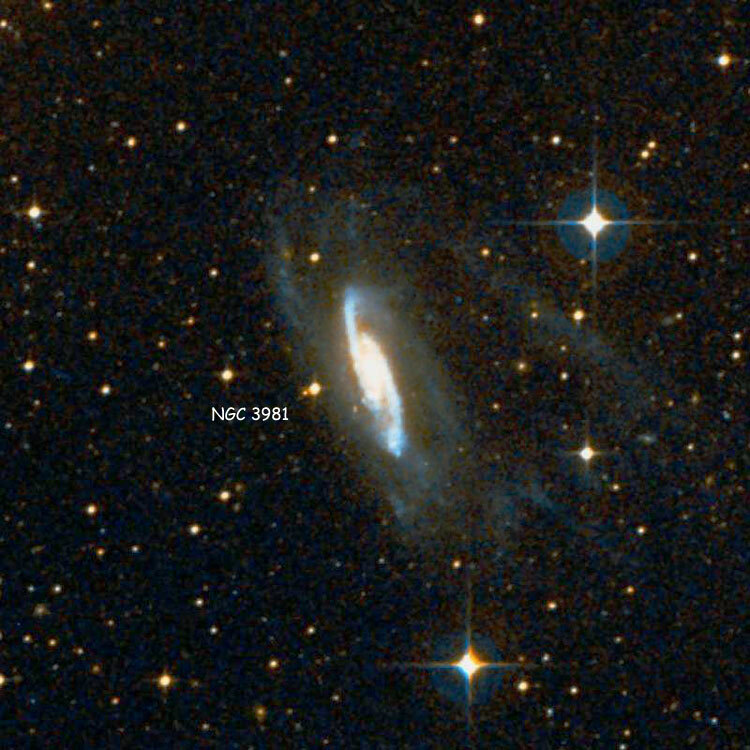 Historical Identification: Per Dreyer, NGC 3977 (= GC 2619 = WH II 790, Dreyer, 1860 RA 11 48 48, NPD 33 50.4) is "faint, small". Historical Identification: Per Dreyer, NGC 3978 (= GC 2627 = JH 1023 = WH II 840, 1860 RA 11 48 50, NPD 28 42.0) is "considerably faint, small, a little extended, brighter middle, 8th magnitude star 6 arcmin distant at position angle 90°". Historical Identification: Per Dreyer, NGC 3979 (Holden (#6), Swift list III (#?? ), 1860 RA 11 48 55, NPD 91 55.0) is "pretty faint, 11th or 12th magnitude star to northeast". Historical Identification: Per Dreyer, NGC 3980 (Swift list I (#18), 1860 RA 11 48 56, NPD 33 50.0) is "extremely faint, pretty large, extended, double star near". Historical Identification: Per Dreyer, NGC 3981 (= GC 2628 = WH III 274, 1860 RA 11 49 04, NPD 109 07.0) is "very faint, pretty large, irregular figure". The position precesses to RA 11 56 12.2, Dec -19 53 45, less than 1.2 arcmin east of the galaxy listed above, the description fits and there is nothing else nearby, so the identification is certain. 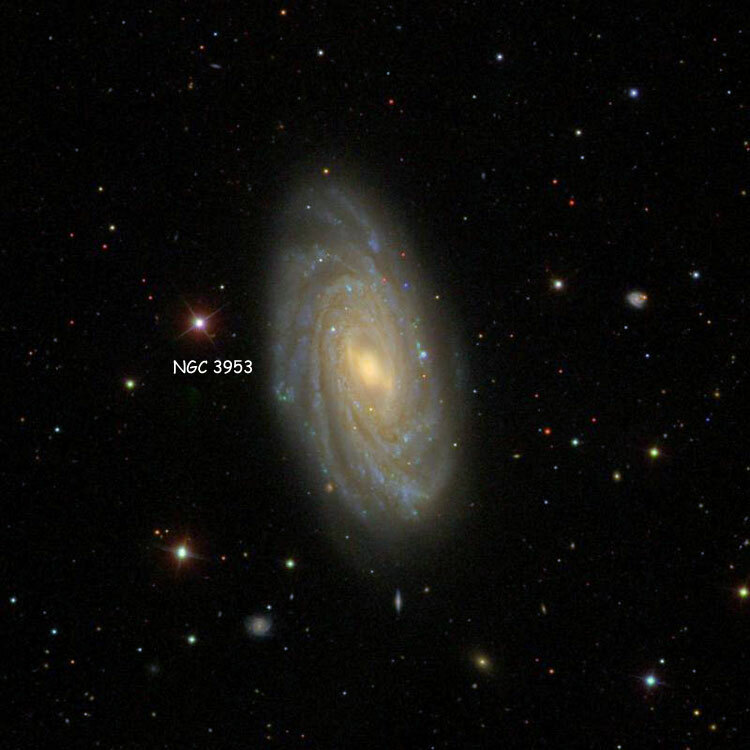 Physical Information: Based on a recessional velocity of 1725 km/sec (and H0 = 70 km/sec/Mpc), NGC 3981 is about 80 million light years away, in good agreement with redshift-independent distance estimates of 50 to 95 million light years (the ESO image discussion lists a distance of 65 million light years). 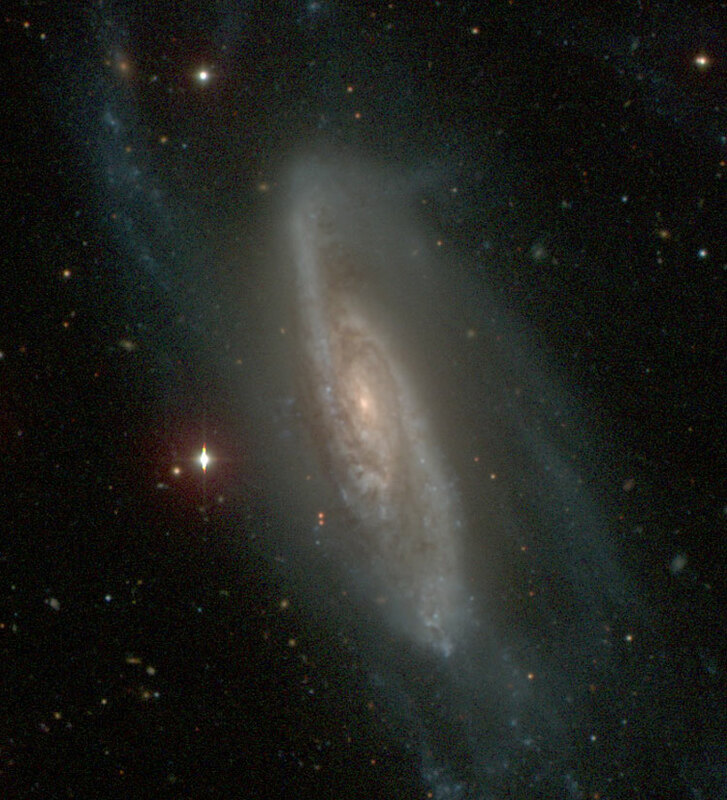 Given that and its apparent size of 2.9 by 0.6 arcmin (from the images below), the bright central part of the galaxy is about 65 to 70 thousand light years across, while its extended arms, which have an apparent size of roughly 7 by 5.5 arcmin, span about 160 to 165 thousand light years. The extensions suggest some kind of interaction with another galaxy, long enough ago that there is now nothing close enough to be an obvious candidate for such an interaction. However, NGC 3981 is part of the NGC 4038 group, named after one of the pair of galaxies called The Antennae, so some member of the group is almost certainly the cause of the unusual structure seen here. 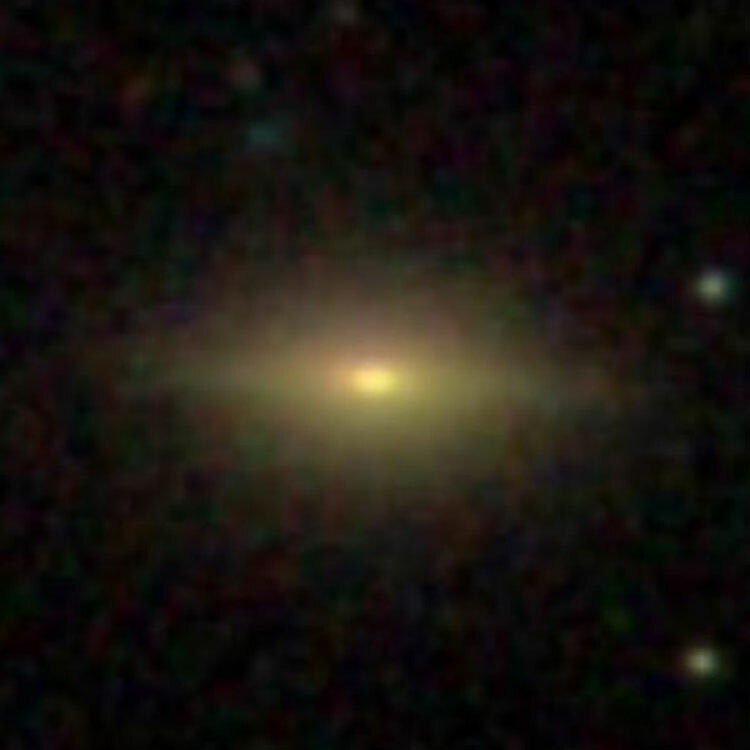 Historical Identification: Per Dreyer, NGC 3982 (= GC 2620 = JH 1017 = WH IV 62, d'Arrest, Schultz, 1860 RA 11 49 09, NPD 34 05.8) is "bright, pretty large, round, gradually then suddenly brighter middle and disc". Historical Identification: Per Dreyer, NGC 3983 (= GC 2629 = JH 1024 = WH III 343, 1860 RA 11 49 10, NPD 65 20.9) is "considerably faint, considerably small, round, pretty suddenly brighter middle". Historical Identification: Per Dreyer, NGC 3984 (= GC 2630 = JH 1026, 1860 RA 11 49 23, NPD 60 13.4) is "extremely faint, small, round, brighter middle". The second IC says "3984: Nothing in this place, Wolf list VIII (h. one observation, about which he seemed rather doubtful)". 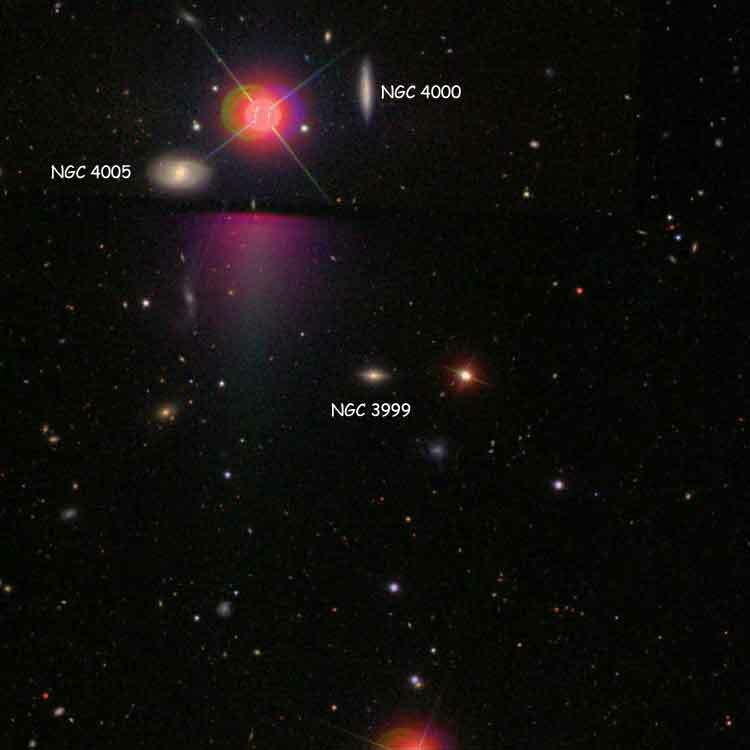 Historical Identification: Per Dreyer, NGC 3985 (= GC 2631 = JH 1025 = WH III 707, 1860 RA 11 49 24, NPD 40 53.0) is "very faint, considerably small, another suspected". Historical Identification: Per Dreyer, NGC 3986 (= GC 2632 = JH 1027, 1860 RA 11 49 30, NPD 57 12.0) is "pretty faint, small, pretty much extended 90°±, 11th magnitude star near". Historical Identification: Per Dreyer, NGC 3987 (= GC 2638, 3rd Lord Rosse, 1860 RA 11 50 07, NPD 64 01.5) is "faint, much extended". Historical Identification: Per Dreyer, NGC 3988 (= GC 2633 = JH 1028, 1860 RA 11 50 10, NPD 61 20.7) is "very faint, small, round, brighter middle like a star, western of 2", the other almost certainly being NGC 4004, but not specified as such in the NGC. Historical Identification: Per Dreyer, NGC 3989 (= GC 2639, 3rd Lord Rosse, 1860 RA 11 50 12, NPD 63 58±) is "extremely faint, very small, round". Historical Identification: Per Dreyer, NGC 3990 (= GC 2634 = JH 1029 = WH II 791, 1860 RA 11 50 17, NPD 33 45.7) is "pretty faint, small, a little extended, pretty suddenly a little brighter middle". Historical Identification: Per Dreyer, NGC 3991 (= GC 5594, d'Arrest, 1860 RA 11 50 18, NPD 56 52.4) is "faint, small, a little extended, 1st of 3", the others being NGC 3394 and 3395. Historical Identification: Per Dreyer, NGC 3992 (= GC 2635 = JH 1030 = WH IV 61, 1860 RA 11 50 19, NPD 35 51.3) is "considerably bright, very large, pretty much extended, suddenly brighter middle and bright mottled but not resolved nucleus". The position precesses to RA 11 57 36.0, Dec +53 21 57, barely south of the nucleus of the galaxy and well within its outline, there is nothing else nearby and the description fits, so the identification is certain. Discovery Notes: Méchain's observation of Mar 12, 1781 was long thought to be the first observation of this object, but as of his letter of May 6, 1783 to Bernoulli he had still not determined its position, and in 2006 Henrik Bril found that based on the "Fortin Chart" Méchain used, he almost certainly observed NGC 3953, instead. Sometime soon after (in late March, April or early May of 1781) Messier observed both NGC 3953 and 3992, and recorded a handwritten position in his personal copy of his Catalog that has the right ascension of NGC 3953, but the declination of NGC 3992. 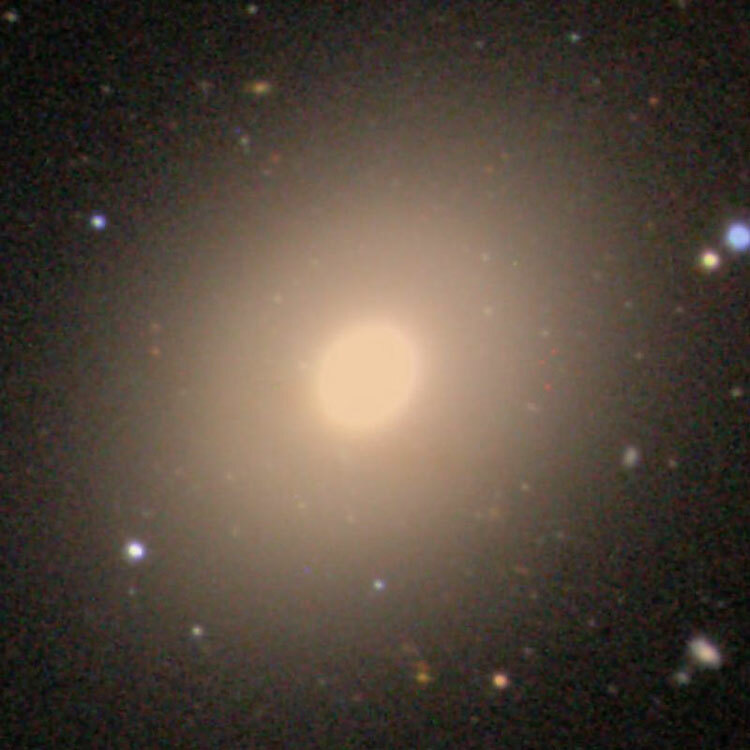 That position is obviously not terribly good, but since its declination agrees with that of NGC 3992, it is reasonably certain that Messier did observe that galaxy, and on that basis Owen Gingerich added it to the Messier Catalog as M109 (at the time thinking that Méchain was the original discoverer, but since it was recorded by Messier, Gingerich would undoubtedly have added it to the Messier Catalog regardless of which of the French astronomers had first right of discovery). Since Messier did not add it to his published Catalog, neither the Herschels nor Dreyer were aware of its prior observation when compiling their various catalogs, causing the lack of any mention of Méchain or Messier in the NGC. 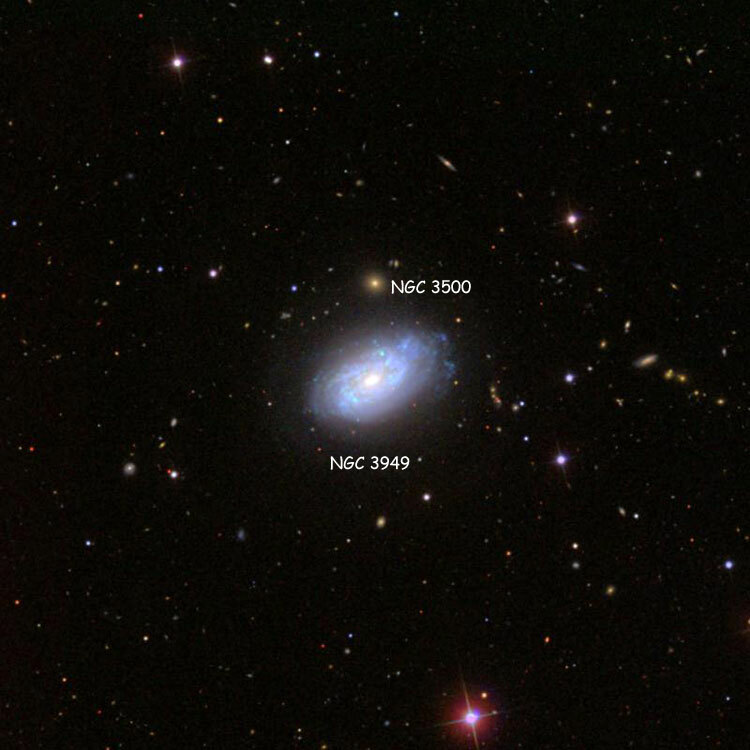 Physical Information: Based on a recessional velocity of 1050 km/sec, NGC 3992 is about 50 million light years away, in reasonable agreement with widely varying redshift-independent distance estimates of 35 to 115 million light years. Given that and its apparent size of 7.3 by 4.2 arcmin, it is about 100 thousand light years across. Historical Identification: Per Dreyer, NGC 3993 (= GC 2640, 3rd Lord Rosse, 1860 RA 11 50 25, NPD 63 58.8) is "very faint, pretty small, extended, 3 stars near". Historical Identification: Per Dreyer, NGC 3994 (= GC 5595, d'Arrest, 1860 RA 11 50 25, NPD 56 56.1) is "pretty bright, very small, 2nd of 3", the others being NGC 3391 and 3395. Historical Identification: Per Dreyer, NGC 3995 (= GC 5596, d'Arrest, 1860 RA 11 50 32, NPD 56 55.0) is "faint, pretty large, irregularly round, brighter middle, 3rd of 3", the others being NGC 3391 and 3394. Historical Identification: Per Dreyer, NGC 3996 (= GC 2636 = JH 1032, 1860 RA 11 50 34, NPD 74 55.5) is "very faint, pretty large, round, 2 stars to east". Historical Identification: Per Dreyer, NGC 3997 (= GC 2641 = JH 1033, 1860 RA 11 50 36, NPD 63 57.0) is "pretty faint, very small, extended 25°, between 2 stars". Historical Identification: Per Dreyer, NGC 3998 (= GC 2637 = JH 1031 = WH I 229, 1860 RA 11 50 38, NPD 33 46.0) is "considerably bright, pretty small, round, very gradually then suddenly much brighter middle". Physical Information: Apparent size 2.7 by 2.3 arcmin. 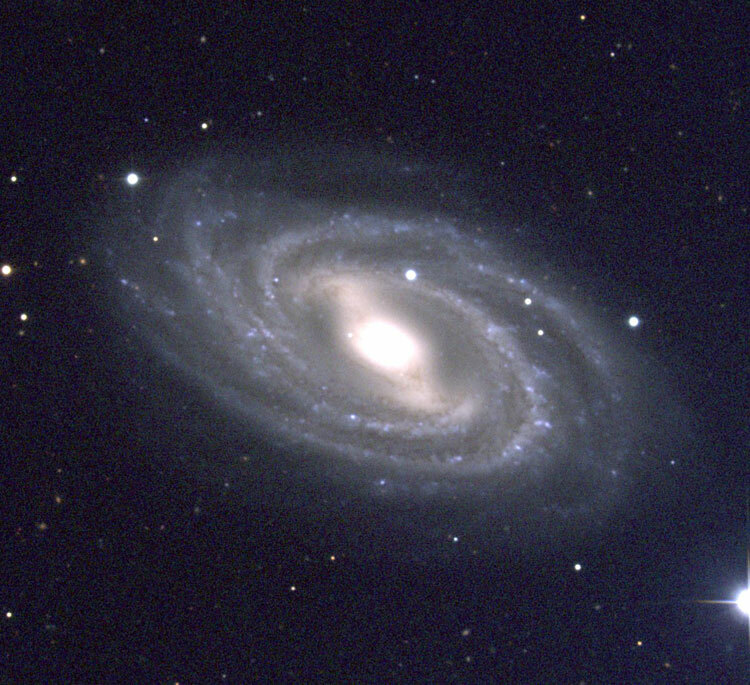 Used by the de Vaucouleurs Atlas of Galaxy Types as an example of galaxy type SA(r)0°. Historical Identification: Per Dreyer, NGC 3999 (4th Lord Rosse, 1860 RA 11 50 44, NPD 64 09.4) is "very faint, small". Physical Information: Apparent size 0.5 by 0.3 arcmin.